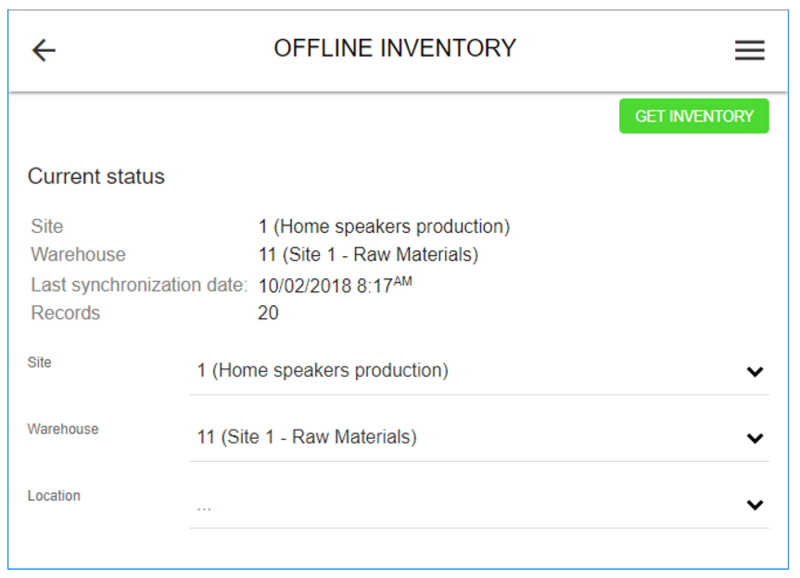 When the EAM Mobile Client is online, you can request item information, allowing you to see inventory status and create item registrations when the Mobile Client is offline. You can use offline item information to create item forecasts and item registrations. This is useful if you work on maintenance jobs in remote areas with limited or no internet coverage. The offline inventory can be used in a remote site, warehouse or as a stock list in your service van. When the EAM Mobile Client is online, you have to select Offline inventory in the main menu and choose which site or location inventory you want to be able to access offline. By selecting ''get inventory'' button, you will download the data of inventory for the selected location. Then you can create item consumption registrations from the offline inventory. When the Mobile Client is online again, item consumption registrations are automatically transferred to Dynamics 365 for Finance and Operations.